Is it your products that your customers see as a commodity, or is it YOU? One of the biggest complaints from medical sales professionals selling in the current marketplace is their customer’s frequent attempts to commoditize their products and services. Sales reps go to great lengths to differentiate their products and even themselves from the competition–except in one area–what they say and focus on. I know…you’re different (let’s hope so), but why not listen to this podcast and see if you meet the first criterion for differentiating yourself at the start of every presentation. Do you do all that things it takes to win at medical sales? Are you sure? In this podcast, I discuss the one thing that great performers do regularly and consistently. If you don’t do this, you’re not fully in the game. What is it? It’s the missing link, and it’s huge! If the title of this podcast seems ridiculous to you and you’re wondering who would ever approach a doctor with a pitch like that, you might want to look in the mirror! Sales reps approach health care buyers way too often with any one of a number of approaches that essentially say the same thing. If you want an idea on how to better connect with your decision-makers, listen to this podcast episode. Medical Sales Mistakes: Brief Encounters with Health Care Clinicians and Decision Makers—To Sell or Not to Sell? What do you do when you have a chance encounter with a physician, nurse, materials manager, CEO, or any other health care decision-maker…do you go for the short, abbreviated sales presentation (e.g. the scrub sink sale), or do you wait for a better time. I have done it both ways and I have worked with sales forces who have done it both ways and one way is almost always more advantageous. In this podcast I recommend what works best in most situations, but of course, the final decision is up to you. You may only have one opportunity—Decide well! 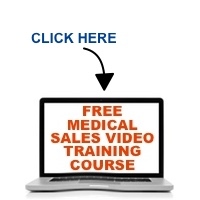 Doctor Doesn’t Think That Sales Presentation Skills are Important…and that’s okay! I had a student who was concerned about one of his doctor-customer’s opinion about the value of a good sales presentation. When you deliver a good sales presentation, your customer should not recognize it as you trying to sell him/her something. Here’s why it doesn’t matter what the doctor thinks–what matters is the outcome. Consultative Selling — the term has become cliche…everyone in medical sales knows the term and says it, but the reality is not everyone is doing it! The challenges of selling to healthcare customers can create an environment and mindset where consultative selling is difficult. In this edition of The Medical Sales Guru Podcast, Mace Horoff addresses the main cause of “the gap” and talks about what you need to do to avoid being perceived as just another product-pusher as opposed to a valued link in the chain of patient care. Serious Medical Sales Professionals Do This To Maximize Their Sales Results with Every Call…Do You? Your healthcare customers demand attention to detail from the vendors with whom they do business, but there is one thing you MUST do if you want to maximize your sales results and meet their expectations. Do you know what it is? In this edition of The Medical Sales Guru Podcast, Mace Horoff describes an essential habit that can separate the true medical sales professionals from the wannabe’s. You might have been told you have beautiful eyes, but your healthcare provider customers and prospects don’t give a darn about your I’s! Don’t take it personally…this is a common mistake that so many medical sales reps repeat day in and day out and they are doing little to differentiate themselves from their competitors. In this edition of the Medical Sales Guru Podcast, Mace Horoff discusses why you need to break this sales-killing habit if you’re guilty. You’ve been to training. You know your medical, dental, or pharmaceutical product or service inside and out. You have rehearsed and perfected the sales presentation and you feel that you deliver it perfectly. However, you’re not closing many sales with healthcare professionals. What’s wrong? Maybe it’s what’s in your head and if you want to move forward with your product or service, you need to fix this first.